SPSS Amos software allows you to model data in using both a programatic and graphical user interface. This software is available to USC faculty and staff via annual subscription. For information on SPSS AMOS licensing for faculty and staff, please see itservices.usc.edu/stats/spss/orderfacstaff. 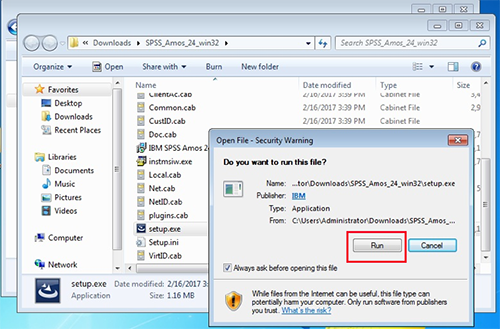 Once you have purchased your SPSS Amos subscription, you may download SPSS Amos 24 at software.usc.edu/spss-amos. This software is available for the Windows operating system only. Click Open folder on the download bar. 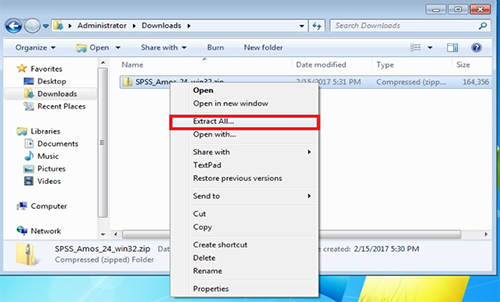 Once the Downloads folder opens, right-click the SPSS_Amos_24_win32.zip file and select Extract All. On the Select a Destination and Extract Files screen, accept the default folder location and click Extract. On the next screen, double-click setup.exe and click Run to begin the installation. If you need assistance completing the installation, please see IBM’s Authorized User License Installation Instructions [PDF]. For user information, including tutorials, see the IBM SPSS Amos User’s Guide [PDF]. For additional assistance, contact the ITS Customer Support Center.